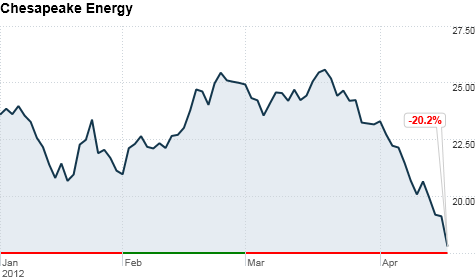 Click the chart to track Chesapeake Energy's stock. NEW YORK (CNNMoney) -- Shares of Chesapeake Energy remained under pressure Thursday, a day after Reuters reported that the company's chief executive has been taking out personal loans to finance stakes in the company's wells, and using those same stakes as collateral for additional loans. Over the last three years, Aubrey McClendon has borrowed as much as $1.1 billion, according to Reuters, citing loan documents. The fact that the loans were not disclosed to shareholders raised concerns that McClendon may be compromising his fiduciary duty, or legal and ethical obligations as CEO, according to Reuters, which said it had more than a dozen academics, analysts and attorneys review the loan documents. Shares of Chesapeake (CHK, Fortune 500) sank as much as 10.2% Wednesday, hitting their lowest level since July 2009, before recovering a bit to end the day down 5.5%. Shares drifted about 1% lower in early trading Thursday. The stock has shed nearly 13% over the past five days. Chesapeake said the loans are permitted under a company incentive program called the Founder Well Participation Plan, which has existed since Chesapeake went public in 1993. The company said the program was overwhelmingly approved again by shareholders in 2005, and will run through 2015. The perk makes McClendon pay 2.5% for the cost of every well drilled during each year he chooses to participate, but also grants him a 2.5% percent stake in the profits of each of those wells. Chesapeake said it drills more than 2,000 wells each year. "The terms and procedures for the program are clear and detailed in every proxy for all shareholders to see," said Henry Hood, Chesapeake general counsel, in an emailed statement to CNNMoney. "Mr. McClendon's interests and Chesapeake's are completely aligned...the suggestion of any conflicts of interest is unfounded." Hood added that McClendon's "personal business is separate from and not material to Chesapeake." This isn't the first time McClendon's personal finances have been entangled with the company. In October 2008, McClendon said he was forced to sell "substantially all" of his shares in Chesapeake to meet margin loan calls, a result of the "extraordinary circumstances of the worldwide financial crisis." At the time, McClendon said he had frequently purchased shares of the company on margin -- using money borrowed from brokers -- "as an expression of my complete confidence in the value of the company's strategy and assets." During the week that McClendon sold his shares in 2008, Chesapeake's stock fell more than 40%. It ended that year down nearly 60%. As the nation's second largest natural gas producer, Chesapeake has been struggling lately with natural gas prices near record lows due to a growing supply glut. Even prior to Wednesday's sell-off, the stock was down more than 14% in 2012. Earlier this month, the company announced three deals that include buying and selling assets to help it raise $2.6 billion. Could natural gas help price water?